Logo of the a precursor to the U.S. Agency for International Development on ammunition packaging found by The New York Times in Libya, pointing to the period, in the 1950s and 1960s, when the United States helped create and arm the military that overthrew King Idris. 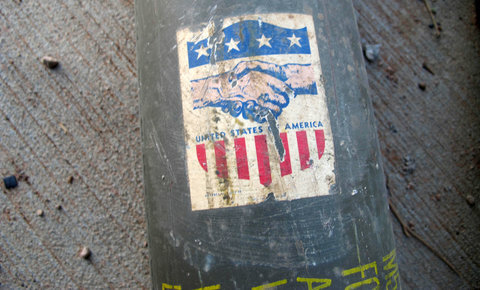 In the case of the photograph above, the sticker had been affixed to a storage tube for an 81-millimeter white-phosphorous mortar round with a point-detonating fuze. The tube, with many others, was found by a reporter for The New York Times in an abandoned government munitions depot that in the summer of 2011 had fallen under the control of anti-Qaddafi fighters. It had been packed, according to the yellow stenciling on its side, in November 1944 — late in World War II, as the United States contemplated the invasion of Japan. Wooden crates containing rifle and machine-gun ammunition, seen below, bore that same label, suggesting an acknowledged state-to-state transfer of ammunition in an aid program. In 1956, the Soviet Union opened an embassy in Tripoli. From this competition a familiar contest played out. Idris was Western-leaning. Hoping to secure this loyalty and deny Moscow a possible ally, the American Embassy in Tripoli asked Secretary of State Allen W. Dulles to free financing under the Mutual Security Program to pay for aid to Libya. The program, which extended the ideas of the Marshall Plan beyond Europe, had been signed into law by President Harry S. Truman in 1951. It allowed the United States to offer food, economic and agricultural training to impoverished nations; it also made available weapons, ammunition and military training intended to help keep anti-Soviet leaders in power. The program found traction. Total American aid in 1960 reached $24.6 million, and by the early 1960s, the Libyan Army had grown to 4,200 men. Then a new factor emerged: oil. Courtesy of Michael CockerellMuammar el-Qaddafi in Great Britain in 1966. It shows then-Lieutenant Qaddafi walking the streets of London, on break from a five-month course at the British Army’s School of Education in Beaconsfield. The instructors there, according to an article by Michael Cockerell in Standpoint magazine, took note of Lieutenant Qaddafi’s intense nationalism and were suspicious of him. They also found him to be not especially remarkable. Adding to the Stockpiles, Which Would Help Topple the Throne Again From here the well-known tale resumes. Muammar el-Qaddafi’s contempt for the United States was clear; he was not open to negotiation on extending an American military presence at Wheelus. In June 1970 the U.S. Air Force handed the base back to Libya. The last American airmen left. Libya, holding billions of dollars in oil money, started buying arms at a scale not previously seen. That brings us back to that logo at the top of the post. The white-phosphorous mortar rounds in that photograph were not alone. The United States had also provided stocks of American rifle ammunition, most notably M2 ball ammunition, commonly called the .30-’06, that was used in American military rifles and machine guns until being abruptly phased out in the 1950s, replaced by the 7.62×51-millimeter NATO round. The photograph below shows several cases that remained last year. Now look at the photograph below. This was another storage tube for an 81-millimeter mortar round, found by The New York Times beside a mortar used by anti-Qaddafi forces skirmishing last summer with loyalist forces on the desert flatlands north of the Nafusa mountains. The packaging indicates that this, and many other rounds fired by the tube, were M57 white-phosphorous (vol. 3, pg. 85) and M301 illumination rounds, manufactured in Redstone Arsenal in Alabama. Blackout illuminates a false choice – India or China?